It is the center of the renal lobule (also known as cortical lobule) that comprises of a collection of straight distal and proximal tubules that direct from and towards the medulla as well as the collecting ducts. It is also known as Ferrein’s Pyramid. It extends to the medulla from the cortex and runs perpendicular to the capsule. The name of the structure does not refer to its location. Rather, it is an indication of the destination of this urinary part. 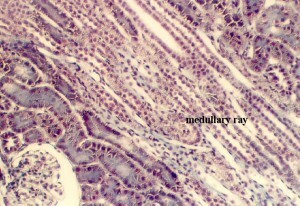 The tubules of this urinary section serve the glomeruli that lie in an adjacent position. Take a look at these images of Medullary Ray to know how this urinary structure appears to view.